Will Seth Rollins slay the beast at WWE WrestleMania, or will Brock Lesnar walk out the reigning, defending, undisputed WWE Universal Champion? Carol thinks the latter. WrestleMania is less than three weeks away and while everyone’s attention is on Becky Lynch vs Ronda Rousey vs Charlotte Flair, there’s one title match that has slipped everyone’s mind. 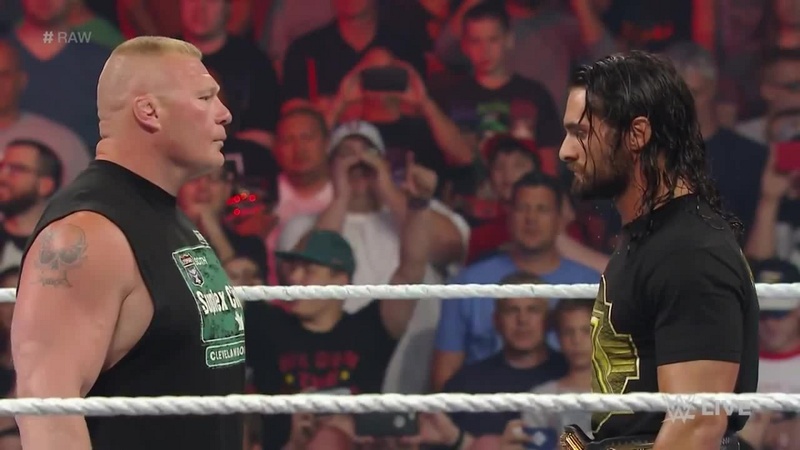 The Universal Championship match between Seth Rollins and Brock Lesnar is a high-profile fight that hasn’t received that much attention. The reason is due to Lesnar’s part-time schedule. Since the Royal Rumble, Lesnar has only appeared on RAW twice and that was to attack Rollins. Rollins has done everything he can to get fans invested in the feud. He’s delivered heartfelt promos while also doing verbal spats with Paul Heyman about why Lesnar doesn’t deserve the championship. Heading into WrestleMania, Rollins is heavily favored to win and end Lesnar’s reign as champion. Fans have become frustrated with Lesnar being a part-time champion and will be cheering when he loses. However, WWE fans shouldn’t start celebrating just yet. WWE is well-known to do stupid stuff and come WrestleMania, I have a feeling they’ll have Brock retain. There are a couple of reasons behind my theory. The first one has to do with the uncertainty of Brock’s future with WWE. Every year around this time, there’s reports questioning Brock’s career plans. Just as fans get excited about the prospect of Brock leaving for UFC, he inks a new deal to stay with WWE. This year, I don’t see things changing when it comes to Lesnar’s status with the company. Brock is one of Vince’s top guys and with new competition popping up; Mr. McMahon is going to do everything to keep his wrestlers from leaving. Brock’s incentives could include more money and a longer reign as Universal Champion. The other reason for Lesnar going over at WrestleMania is Seth’s health. Rollins has been having issues with his back, which has kept him off of house shows. Recently, he wrestled on RAW and showed that he was still in top form heading into WrestleMania. However, Seth’s back issues could be a concern for WWE officials, and that may very well play into their plan of whether Rollins wins the Universal Championship. The last reason to be concerned about the match has to do with the return of Seth’s Shield brother Roman Reigns. Prior to announcing his battle with leukemia, Reigns was the Universal Champion and was feuding with Brock. With Reigns now healthy and has returned to wrestling, Vince may decide to resume the Roman vs Brock feud, with Reigns conquering the beast and reclaiming the championship. If any of these scenarios were to happen, it would be unfair to Seth. Rollins has had a phenomenal year and there’d be no better way to cap it off by having him win the Universal Championship at WrestleMania. But given how notorious WWE is for swerving fans, it wouldn’t be surprising if we had another outcome like last year’s WrestleMania. My advice to WWE fans is to prepare for the worst when it comes to WrestleMania, because odds are that Brock Lesnar’s reign as Universal Champion will continue. SANADA, From Breakout Performance To Breakout Year ?